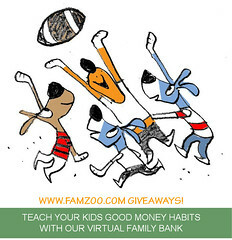 There are 6 different FamZoo giveaways (coupled with a gift card in some cases) going on right now on 6 different blogs. Click through each link below to see the FamZoo review, what's being given away, how to enter, and when entries close. Some close today and the rest close over the next few days, so hurry! I entered them all and am hoping for that Lifetime membership! We have three kids and will start allowances this summer based on chores. I love that you can break everything down for them and my 9 year old would just love this. Right now we have piggy banks but it would be great for them to see the graphs and realize they could be earning interest too! Wow - all 6! That's an impressive effort! Good luck! Note that you'll be able to redeem the winning lifetime coupon code either at registration or after the fact (on the Store tab), so if you want to get your family started right away using our standard free trial, you can. We look forward to having your family on FamZoo! So here's my comment for that one, and NOW I've entered all 6. My last comment isn't showing, and I can't remember if you're moderated or not, so I just wanted to say thanks again for the great tech support! I'll be sharing your site in our district's newsletter! It really is well-thought out, and a great way to teach children the value of a dollar! Oops! Thanks for reporting the incorrect link for Kelly's post on TheCentsibleLife. Just corrected it. We really appreciate the compliments on FamZoo. And, thanks so much for helping us spread the word via your district's newsletter! This is just too funny! I just got an email from Amy at Money4ThisNot4That and I won the lifetime membership. Who would have thought! I am so happy and already signed up and played around with the software this afternoon. My 9 year old is so going to love this.